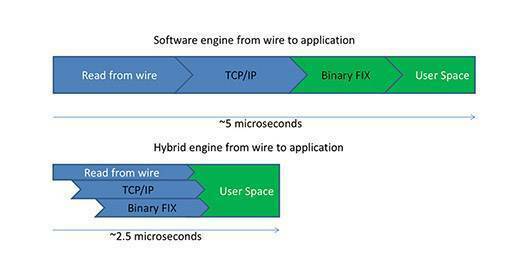 The diagram below shows a 8 Session 15k msg/s wire to wire Latency Performance, Cheetah Software with Solarflare network card v’s FPGA Accelerated Cheetah Software. 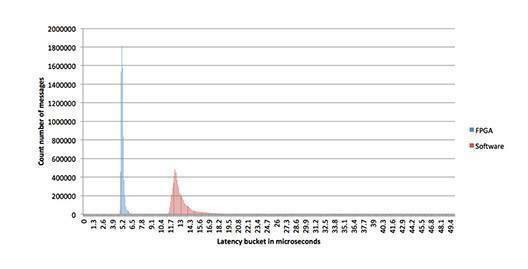 Graph below shows Buy Orders – Execution Venue simulating a 50 microsecond order matching delay. It also shows the latency of the workload completion over a 300 microsecond range, comparing open source against the commercially available Java FIX engines.